By now, most of us are all too familiar with the annoyances that come with compact fluorescent lamps. Yeah, yeah, CFLs use about a third as much energy as old-school incandescent bulbs, last many times as long and can save consumers an average of $50 over the life of a bulb. But the light that standard CFLs give off doesn't seem inviting, they can't be used with a dimmer, and they take way too long to turn on. Take heart, however, because a new generation of CFLs aims to address these concerns. And other lighting innovations are hitting the market just as President Obama ups the efficiency stakes. This summer he announced tougher standards that, in combination with a law passed in 2007, will ultimately make it a lot less expensive for Americans to light their homes and offices. Electric lighting currently accounts for 19% of the world's electricity use, pumping as much greenhouse-gas pollution into the atmosphere every year as half the world's cars. Much of that results from outdated, inefficient light sources in homes, offices and parking lots. Energy-efficiency advocates say that because lighting is ubiquitous, the new guidelines will have a bigger environmental impact than any other appliance standards, including those for refrigerators and air conditioners. As CFL manufacturers improve quality--Earthmate's latest offering contains 80% less mercury than the standard curlicued CFLs--incandescent makers are fighting to stay in the market. For instance, Philips' new Halogena line uses 30% less energy than traditional incandescents, enough to meet the government standards that take effect in 2012. 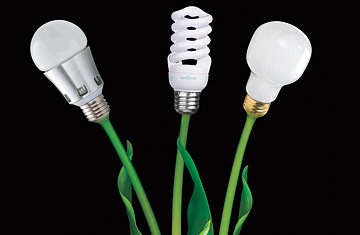 But CFLs and incandescents could both be left in the dark by LEDs, or light-emitting diodes. The leading lighting companies are racing to release traditional-bulb-shaped LEDs that last five to 10 times as long as CFLs, contain no mercury and use far less energy. These amazing new lights also come with a flashing-neon price tag: $50 for Lemnis Lighting's Pharox, which uses 6 watts of power to match the output of a 60-watt incandescent. Lemnis co-founder Warner Philips, whose great-grandfather started the lighting giant Philips Electronics, says that despite the sticker shock, demand is surging for Lemnis' LEDs. One early adopter is Google, which recently bought 25,000 bulbs from the Netherlands-based company. So far this year, Lemnis has received orders for 3 million Pharox bulbs, mostly from Europe; it will start selling them online in the U.S. on Aug. 15. Getting Americans to switch from paying 50¢ for a lightbulb to $50 won't be easy. But such shifts have happened before. Electric toothbrush, anyone?